A kinetic owl sculpture standing 6½ ft tall, “Patterson” watches the passers by on Madison Avenue - his bicycle chain trimmed beak telling holiday tales. As his head rotates left and right, he ruffles his wings within a massive nest made of branches and industrial remnants. Covered with steel, aluminum, and brass feathers, “Patterson” lets people on the street look into his mechanical heart through a lit portal (salvaged from an old sailboat). A second portal on his side invites inquisitive viewers to see his inner workings. 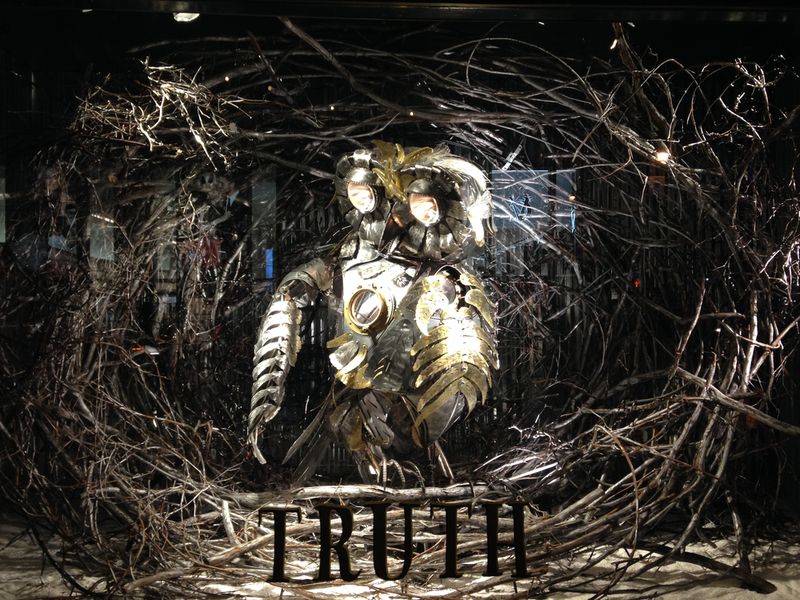 This True Owl is part of the holiday window display for Barneys New York. The theme, the unveiling, and the response are beyond belief. 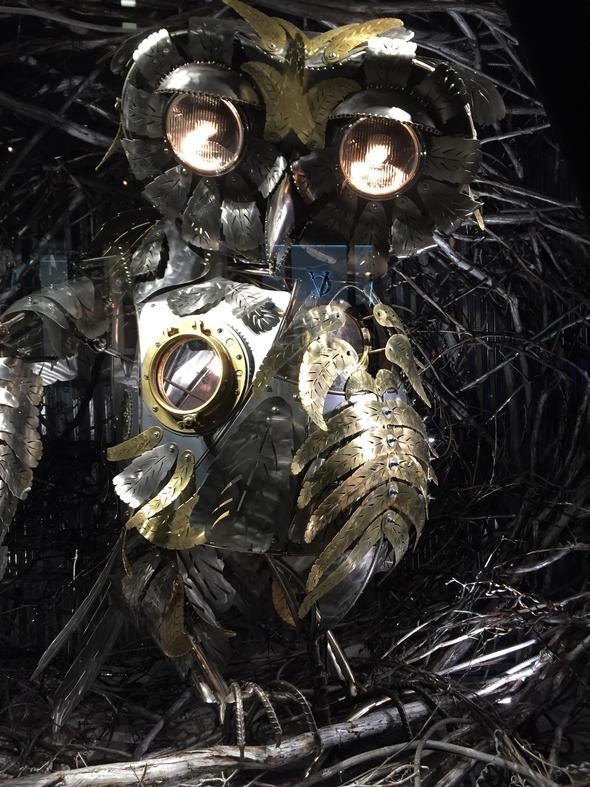 I was commissioned to create “Patterson” – the wise owl for BAZ DAZZLED, a collaborative endeavor with Barneys New York and the cinematic duo Baz Luhrmann and Catherine Martin. The 2014 multi-platform holiday extravaganza for Barneys New York flagship windows on Madison Avenue includes fantastical characters, woodland creatures, ice skaters, snow owls, and candy canes. A kinetic owl sculpture standing 6½ ft tall, “Patterson” watches passers by - his bicycle chain trimmed beak telling holiday tales. As his head rotates left and right, he ruffles his wings within a massive nest made of branches and industrial remnants. Covered with steel, aluminum, and brass feathers, “Patterson” lets people on the street look into his mechanical heart through a lit portal (salvaged from an old sailboat). A second portal on his side invites inquisitive viewers to see his inner workings. I was excited to create a wise and happy snow owl for this event; I’d been considering doing an owl for some time. While the past two months in my studio were intensely arduous, I’m pleased with the way this piece has pushed my work in new directions. The scale and inclusion of laser-cut details are hugely motivating for me. (I typically hand cut the decorative elements for my pieces. Laser-cutting my own designs allows me increased consistency and intricacy in the exterior details. My work is always an amalgamation of new and salvaged materials. “Patterson” is no exception. The skeletal structure is made of rebar and salvaged brewery equipment - stainless steel tubing given to me by Crux Fermentation Project. The outer shell is composed of hand cut sheet steel (some of which was powder coated by Armadillo Powder Coating and adorned with my own unique concept of feathers, which I had laser cut by Max Mfg. And of course, there are bicycle parts. I’ve included salvaged bicycle chain, cogs, and forks as well as new dropouts and hubs from Sunnyside Sports. Using a variety of tools and techniques, the creation of Patterson included many hours of welding, plasma cutting, laser cutting, slip rolling, planishing, grinding, riveting, and bolting. Built in my studio in Bend, Oregon, he was carefully packed and driven across the country. Being involved in this holiday extravaganza has been an unforgettable experience. After being asked to create a snowy owl, I did a few sketches and looked at a lot of owl photographs. For the most part, though, I designed this piece as I worked, figuring out how I wanted the piece to move in my head. I started with the motor placement and built everything out from there.